Surface Headphones review: Is Microsoft's first bash at over-ear cans any good? The Surface cans offer big sound and great, while the rotational controls around the earcups are the pièce de résistance. However, we'd like more distinctive noise-cancelling modes and sound profiles to really set these bland-looking but great-sounding cans apart from the considerable competition. Do we really want Windows logos on headphones? Arguably nobody had expected Microsoft to reveal Surface headphones back in late 2018. But reveal it did - and fair game, too, considering the success of the Surface 2-in-1 and that the Seattle-based company had been developing these over-ear cans for three years before revealing them to the world. 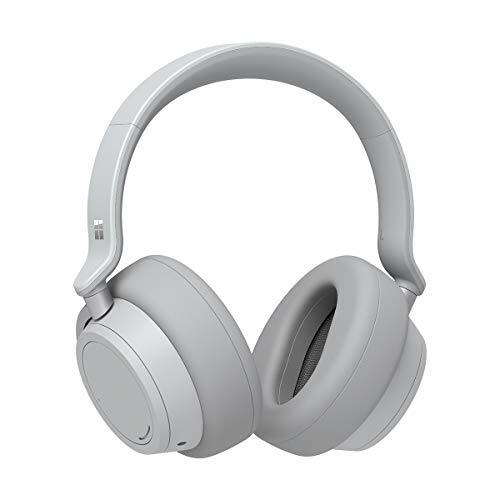 First thing's first: despite being Surface headphones with Microsoft Windows branding and a very, very grey - sorry 'Platinum' - Surface-like finish, these headphones will work with any Bluetooth or 3.5mm equipped source. You don't have to be a Windows/Surface/Microsoft user (oh the looks we got on the train when plugged into a MacBook Air!). So what's special to the Surface Headphones? The dual rotational earcup design is unlike anything else we've seen, comfort is optimum and noise-cancelling offers multiple levels. But with a price tag a penny shy of £330 is Microsoft really ready to take on Bose, Sony, Beats, B&O, et al? Like we say, the grey finish is, well, really grey. There's no colour pop, no additional natural materials that jump out: the Surface Headphones is grey from top to bottom. Which means it's an inoffensive looking setup, but kind of boring too - especially when sat next to the leather-topped BeoPlay H9i. Our bigger qualm than the colour, however, is the Windows logo that appears on the stem above each earcup on both sides. That's bold for the first pair of Surface Headphones, really, and not a feature we've especially taken to wearing. Does anyone really need a Windows logo on their headphones? The answer is subjective, of course, but it's not for us. Those downsides brushed aside, however, and the Surface Headphones makes for a really comfortable wearing experience. The earcups are coated in soft cushioning - we've been wearing them for hours at a time and haven't found them to be tiresome to the head or sweaty around the ears. Apparently Microsoft called upon its Xbox and gaming industry contacts to get some advice here on how long-wearing headsets should function. Secondly is the way in which the earcups house the controls in rotational dials. We've seen touch-gesture headphones before - something that these Surface cans also offers with single and double taps and long-press for play/pause, next/previous and decline call, respectively - but the integration of these rotational dials is subtle to the point you can't obviously see it on the design. Using these silky smooth rotation controls feels great; the left earcup's dial handles noise-cancelling control, while the right deals with volume. When you place the Surface Headphones over your ears and hit the on button (on the right earcup) a female voice says "hello" and then tells you how long the battery will last. It's a nice idea, but the voice is a little too quiet. We also had an issue the very first time of wearing - despite charging up overnight there was no response when turning the Headphones on. And it's not an issue with them being idle: every time since (having charged them again) and our review sample has always had battery, even when forgetting to actively switch them off. Active noise-cancelling (ANC) technology is an important feature for many when choosing headphones. If you're a traveller and want that 'hiss' or a train or plane cut out of your ears then it's a must-have option. Microsoft's approach to ANC is a little different to some other makers. The Surface Headphones offer a supposed 13 levels of ANC, adjusted by rotating that left earcup dial - there's a beep when it's activated and a different beep when it's maxed out (both of which, like the voice, are too quiet). Which is all well and good, but there's no discernible way of differentiating between these 13 levels - we really think these cans should have, say, four different and distinctive ANC modes and be done with it. Furthermore, while the ANC is certainly effective - it'll reduce that hiss of air noise to some degree, as we've said - it's not nearly as powerful as some solutions on the market. The Bose QC 35 II, for example, offer the go-to traveller's considerable ANC, which is perfect for really eradicting background noise. With the Surface Headphones it's not nearly as extreme, with voices being fairly clear in nearby surrounding areas. And while some competitors, such as the B&O H9i, offer less cutting ANC power, that subtlety is delivered in a simpler on/off form that's cleaner in its delivery (there's something kind of 'mechanical' about the Microsoft solution at certain levels). Other cans without ANC offer a snugger fit with better sound isolation too. Microsoft is clearly onto something with how minutely adjustable the Surface Headphones ANC can be. But we think there's room for more extreme cancelling, more distinctive modes, and greater clarity when selecting between them. We love the earcup rotational dial control, now there just needs to be some more clear-cut options like with the Sony WH-1000XM3 to make this product really shine (and that could be done with a software update, we suspect). Remove the headphones from your head and the ANC switches off automatically, while the track playing will pause within three seconds. Pop the cans back on your head and, again within three seconds, and the track starts to play again - with ANC kicking back in about half a second later, as to tell you've got it activated. On the sound quality front, however, the Surface Headphones offer a powerful output from the built-in 40mm drivers. The frequency response covers the low-end, with bass pumping out warmly - but without being overpowering, like you can find in some Beats headphones. Because the cans are large, cover the ears and the drivers are positioned to push sound directly into your lugs, the soundscape feels fairly wide. Treble dances around while bass stays firm in the middle, assuming you've got the weaing position down perfectly (with a hood up in the rain we found that harder) but these two polar opposites are the core features of the listen - the mid-range isn't quite as 'snap-happy' as some other cans that offer a bit more snare crunch. The important elements are here, that's for sure. We think Microsoft could again offer greater options to control the sound profile though. An app, say, with different genre and equalisation options could make the Surface Headphones' sound profile better fitting for a wider audience. As it stands we think the sound is great and those calling out these cans for not delivering on quality ought to turn the volume up a little higher and let them breathe - because there's every bit the quality of a £330 headphone on offer here. That said, with no Qualcomm affiliation there's no aptX or aptX HD for higher-end streaming quality. In terms of longevity per charge you can achieve up to 15 hours of listening time. The female voice when popping the cans on has never told us we've got more than 12 hours, mind, so we've consistently been achieving less time than quoted overall. Charging is easy via USB-C, though, with fast-charging offering a full recharge within two hours (although, as we said, our first full charge depleted to nothing within a couple of days without us knowing in a one-off oddity!). Should the battery deplete entirely then you can use the Surface Headphones in passive mode. Just pop the 3.5mm cable in - which protrudes out from the body of the cans in a bizarre way, we must say - and you're good to go (well, if your phone/device has a 3.5mm jack these days). We don't like the way the metal component of that cable is exposed (see above) though. For a first try the Surface Headphones get a lot right. The sound is big, the comfort is great, the rotational controls around the earcups feel great in use, while active noise-cancelling will draw in those hard worker who don't want to be disturbed. But there are imperfections. The noise-cancelling should offer distinctive modes and, in our opinion, offer a stronger mode to rival the Sony and Bose products out there. An app with a broad range of sound profiles would help reach a wider audience and provide more distinction too. And the very grey design could be more interesting - especially seeing as Microsoft's own Surface 2-in-1 devices offer colourful keyboards, so we don’t really get why the Headphones offer just the one mute colour form. All that said, we'll be using the Surface Headphones for some time to come thanks to the great battery life, controls and general comfort. The second-generation model ought to be even more stand-out with a few tweaks that could see it match or outsmart the competition. These over-ear cans offer great sound and immense noise-cancelling options. Winner of the Pocket-lint Best Headphones award in 2018, there's little better out there. Ultra-lightweight, these are the noise-cancelling champions for travellers. The noise-cancelling is less extreme than any of the above models, but the great design and awesome sound quality make these cans worth their (admittedly massive) asking price.